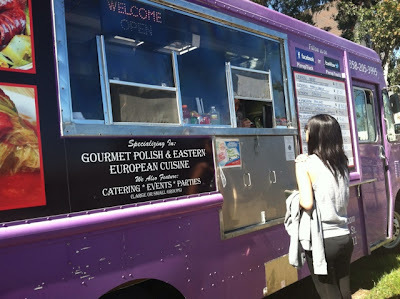 A short while ago, I have noticed the Pierogi Truck parked near the San Diego State University campus and I was curious. I wondered how long they would be parked there and wondered about pierogi and the prices. 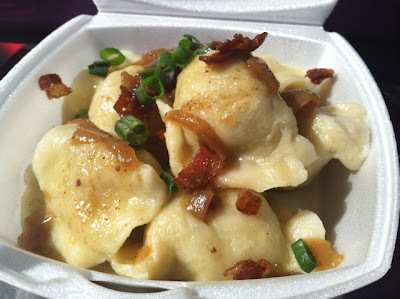 Pierogi [plural] are similar to gyoza and ravioli; basically they are dumplings filled with meat, sauerkraut and/or cheese. 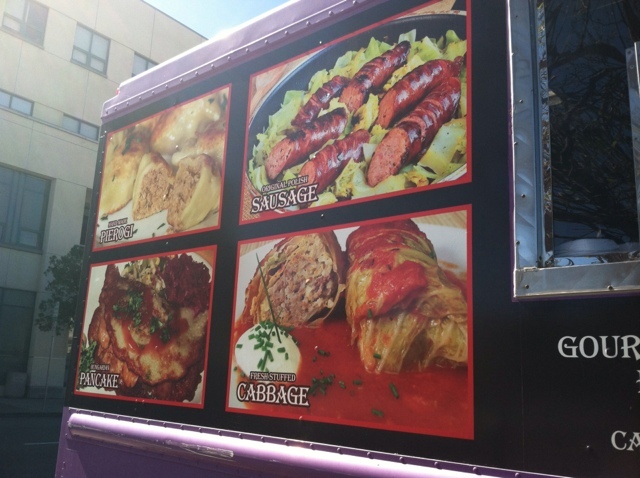 The Pierogi Truck is run by a Polish family who wanted to serve authentic Eastern European cuisine in San Diego. They serve many other dishes other than pierogi. They even have vegetarian dishes and a turkey wrap on the menu! After reading the reviews on Yelp, I was excited to try something different for lunch to satisfy my palate. 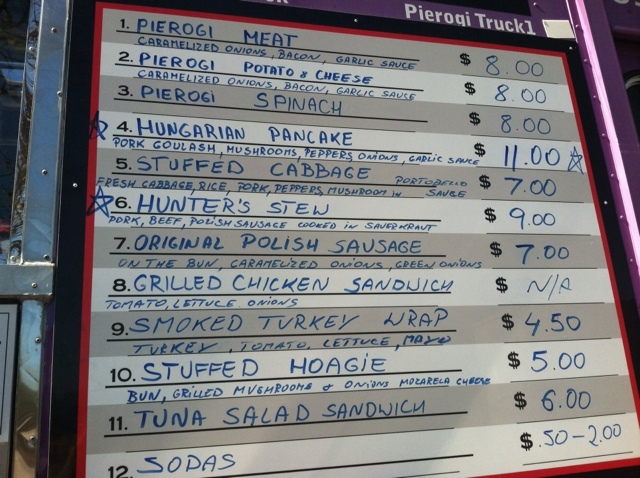 My friend and I decided to skip the usual lunch spots and visit the Pierogi Truck one afternoon for lunch. 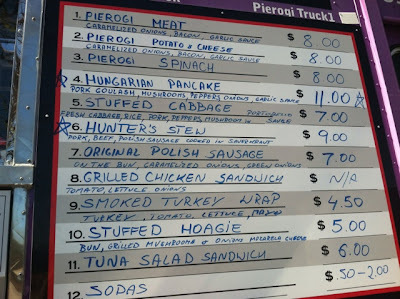 I knew I wanted pierogi since I have never had them before. The cute Polish woman in the truck was very sweet. I asked her if they had a lot of foot traffic here and she replied, "Unfortunately, not really." I told her that we would help spread the word. My mouth was watering as I waited for my order of fresh meat-filled pierogi sauteed in a little butter and topped with caramelized onions, scallion and bacon. 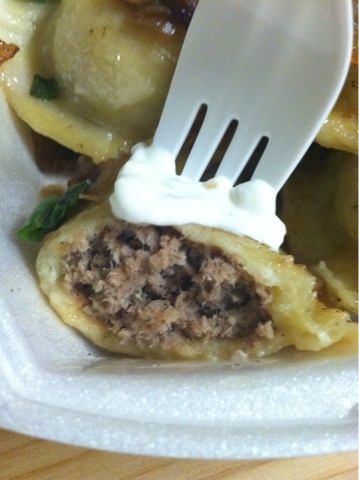 My order came in a small styrofoam box filled with six pierogi and a side of a sour cream based garlic sauce. The pierogi dough was thick and cooked all the way through. The meat inside was flavorful. The pierogi was pillowy soft and had great texture. The onions added a sweetness, the bacon added a touch of salt, and the sauce, which had a garlicky kick, was a must with every bite. My tummy was happy even though I could have eaten a few more. My friend ordered the original Polish sausage and a side of sauerkraut. 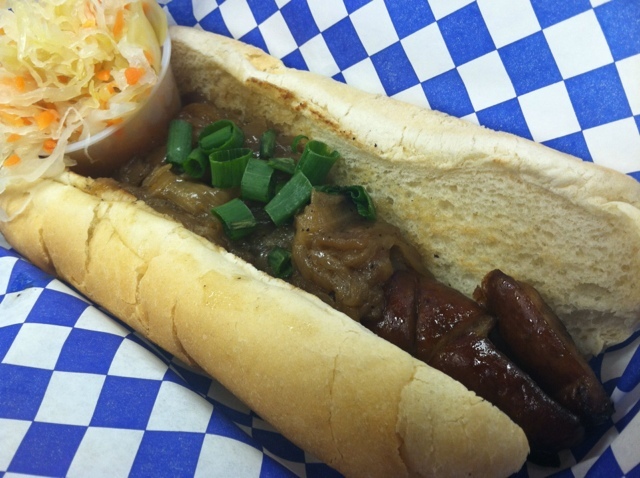 The Polish sausage was shipped from Chicago from a Polish restaurant. I had a sample of the sausage and yum, there was crunch from the casing and it was very delicious! 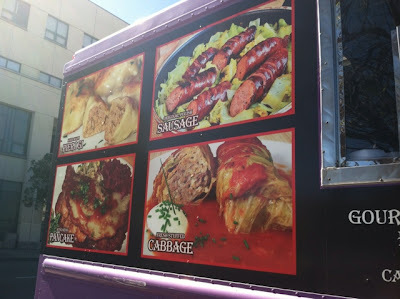 Unfortunately, the Pierogi Truck no longer is parked around campus, but of course, you can find them around San Diego at food truck gatherings, special events, or possibly in your neighborhood by following them on Twitter. We were glad that we experienced their food while they were in our neighborhood. 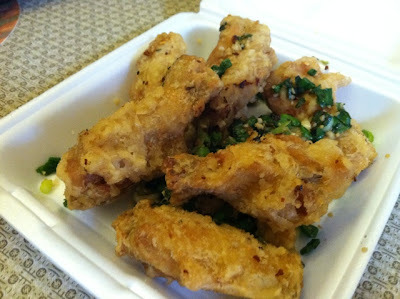 I can't believe I have not yet blogged about salt and pepper chicken wings. In San Diego, almost every [non-chain] Chinese restaurant has these special wings on their menu. 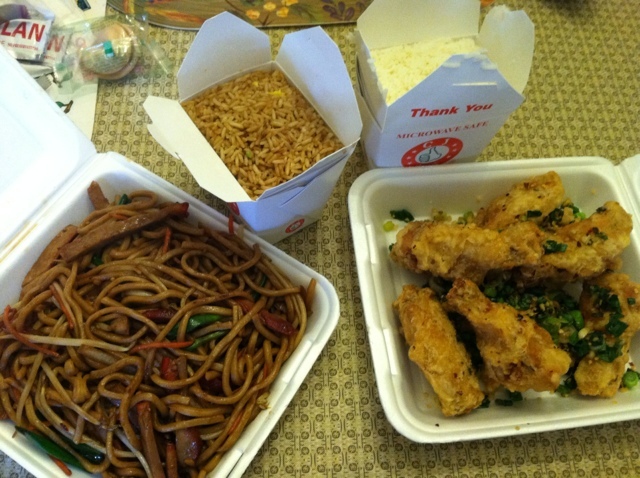 Golden House Chinese Restaurant located in Otay Mesa, I believe, has the most delicious wings in town. I was a huge fan of National City's Golden Chopsticks' salt and pepper chicken wings until recently when we received an order with unrecognizable chicken parts. It was pretty disappointing. Golden House's kitchen always serves large drummettes and wings (real chicken parts) and are ridiculously priced low ($8.00). They even give you a pint of steamed or fried rice with any entree order. When you order the wings to go, Golden House cuts a triangle on the top of the box so the steam from the freshly fried wings can escape to prevent sogginess. Genius. 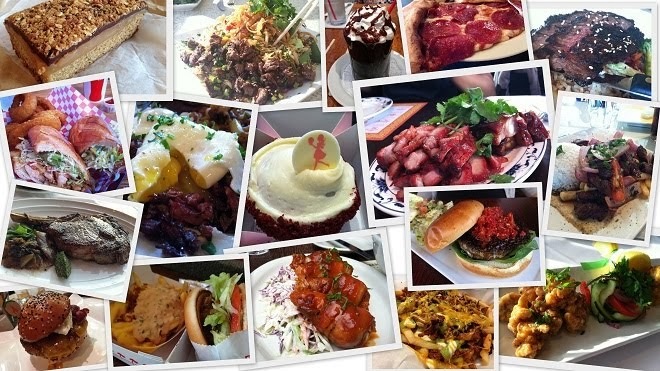 Lunch specials are from 11am to 3pm everyday for $5.50. That's right, every day... Sunday through Saturday. If you eat inside the restaurant, the special comes with their addicting wonton chips with warm sweet and sour sauce and a cup of egg drop or hot and sour soup. For this food adventure, the hubby and I ordered two lunch specials to go for us to share. We ordered the salted pepper chicken wings and bbq pork lo mein (chow mein) with one pint of steamed rice and one pint of fried rice. The salted pepper chicken wings were fried to absolute crispy perfection and were topped with scallion, fried garlic and red pepper flakes for extra flavor and a touch of heat. My mom and I are trying to figure out how the outcome of these wings are extra crispy on the outside and super moist and juicy in the inside. The bbq pork lo mein is one of my personal favorites. 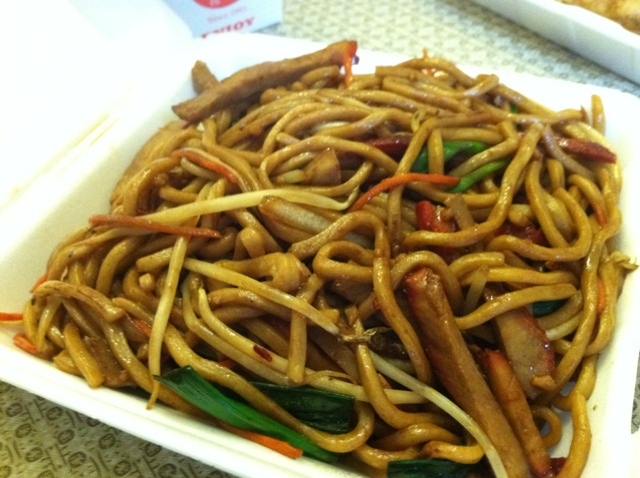 The noodles and vegetables are flavorful, has the right amount of seasoning and the bbq pork is thinly sliced. We only paid $11.68 for lunch and left us with our bellies full (without soup and wonton chips too)! 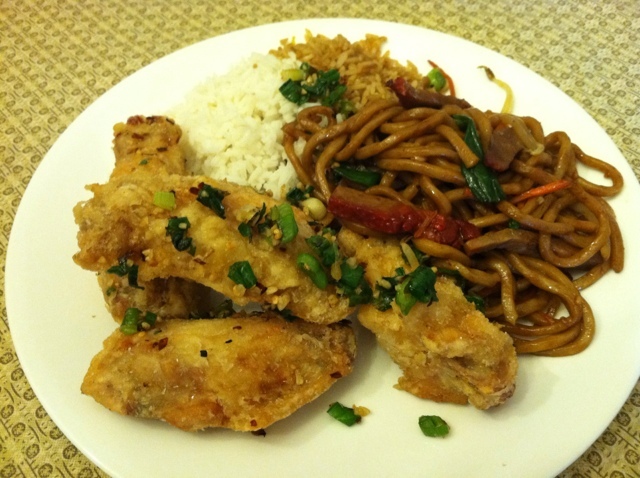 If you are on the quest for yummy wings in San Diego, give Golden House a try. You will thank me!